What does Technology have to do with real estate? Realtor Magazine just featured an article on The Internet of Things. Author, Meg White, shares "A growing web of connectivity among people, devices and homes will upend the way we interact with the world. " I agree that The term "Technology" is used rather loosely as a catch all phrase. We live in a fast paced society and people typically want answers to their questions immediately! Technology changes the way we do business and our lifestyle. What does Technology have to do with Real Estate? Google just changed the way information will be ranked and search engine optimization of the way websites will appear. Tech geeks referred to the implementation as "mobilegeddon" which went into effect April 21, 2015. CNNMoney shared 5 Fast Facts of the new Google impact of what it really means for a website to be mobile ready. Consumers expect to search with ease for what they are looking for. If a website is not updated it takes forever to load on any mobile device. Home buyers don't have the patience to wait for a website to load they want to be able to search instantly and have information at their fingertips! I do my utmost best to stay informed of technology changes so I can implement the best "search tools" for my clients. 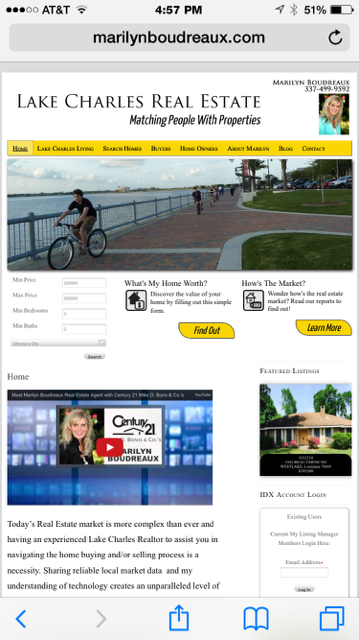 I'm happy to say that I survived the Google "mobilegeddon" and my Lake Charles Real Estate website is mobile ready! This is how my Lake Charles Real Estate website appears on my iPhone, it looks the same as it does on a Tablet or Laptop computer. Lake Charles Home Buyers and consumers can easily search Lake Charles real estate on any device effectively. Technology in real estate is not limited to "Social Media" and blasting your listings on social platforms. Social Media is a great avenue to share and connect with the key aspect being "SOCIAL". Just because a Realtor shares a property for sale on a social media platform doesn't guarantee the visibility of the post or creating a buzz or interaction with others. Does the agent have an effective media strategy in place? When listing a Lake Charles Home for Sale, and choosing a Lake Charles Realtor check out the Realtor's Facebook, Twitter and Google activity. If you notice a lapse between posts or activity then the Realtor is probably not using Social Media as an asset to market your home. I am very easy to follow on many social platforms where you can find my real estate tips, blogs, and experiences about Lake Charles and our communities via Marilyn’s Lake Charles Real Estate Blog. I am not ashamed to call myself a "Geek" and am very honored that Century 21 has recognized me as a Tech Savvy Lake Charles Realtor. The Century 21 Producer Technology Award is presented to the one individual sales associate per year in the CENTURY 21 System of more than 101,000 affiliated agents who focuses on technology to better serve real estate consumers, and to grow his or her business. The goal as your Lake Charles REALTOR is to get your property SOLD. Marketing and lead capture of potential buyers is a topic Sellers should inquire about with their Realtor before listing a home. If you are considering selling a home in Southwest Louisiana, contact Marilyn Boudreaux, Century 21 Mike D Bono & Co.'s. I would welcome the opportunity to share how I incorporate technology into my marketing plan to get your Lake Charles home visible to potential buyers!